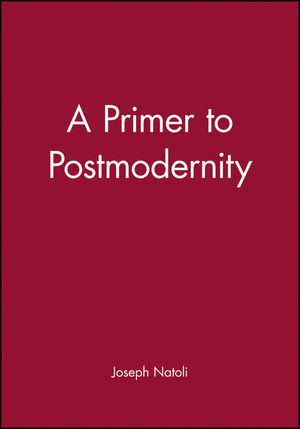 A Primer to Postmodernity introduces the general reader to an emerging 'postmodern' world order by giving us `just the facts` through contemporary cultural lenses. Joseph Natoli teaches at the Centre for Integrative Studies at Michigan State University. He is co-series editor of Postmodern Culture, a series published by the State University of New York Press. 1. Is This a Postmodern World?. 2. How Do We Create a Sense of Realism? Or, Do We Just Discover it?. 3. Classic Realist Formulas in Action: Film. On the Edge of Postmodernity. 5. Moving Across the Profound Surface of a Postmodern Life. 6. Yes, There is a Postmodern Political Struggle. 7. Postmodernity's and the Market. 8. Meditating on Postmodern Ethics and Religion. 9. Facing the Monsters: History in the Hands of Postmodernists. 10. Enacting the Postmodern: The Primer's Glossary of Cultural Studies. * Clearly intended for students who have had no exposure to postmodern theory; witty, accessible and engaging style. * Illustrates elements of postmodernity through current examples in popular culture and politics. * Makes the connection between postmodern theory and cultural studies.